Due to the wealth of track and field talent throughout Ohio over the years, new state records are not established very often. When these rare occasions do arise, though, it's important that they're celebrated. And it's possible that we may need to brace ourselves for one of these celebrations at some point soon, in relation to the women's long jump event. Paige Floriea has been rapidly climbing the state's all-time list and it appears as though she's only getting started. Just a sophomore, the Mentor representative currently resides in fourth place with her personal best mark of 18-11, which she achieved this season during NEOITC competition. The statistics suggest that she's got a great shot at one day becoming the state leader. Her wide array of jumping achievements have been racked up quickly and they're continuing to grow on a meet-by-meet basis, it seems. Achievements that include a runner-up effort during her freshman year at the Division 1 Indoor State Championship and a 2018 season's best jump of 17-11, that was recorded at the state's most competitive invitational, the SPIRE Showcase. Paige Floriea excels in the long jump event, both indoors and outdoors. To complement her work inside, Floriea's outdoor accomplishments 'aren't bad' either. Aren't bad as in claiming third at last year's D1 State Championship, sixth at one of the country's premier meets, New Balance Nationals and jumping over 20 feet -- 20-0.75 to be exact. So if the indoor long jump record were to eventually change hands, what exactly would Floriea need to do in order to get there? Well, the athlete immediately in front of her in the standings only owns a quarter inch edge (Cheyanne Carter / Eastmoor Academy with a 18-11.25 mark) and while it won't be easy, due to how close she already is, Floriea could potentially surpass that jump during her next start. The top two jumpers on the state list, however, present marks that will certainly be a formidable challenge for Floriea, or anyone for that matter, to overtake. But whoever said breaking records should be easy? Number one and number two are both Elyria grads: Tianna Madison and Christina Madison. Tianna leads the way with a jump of 20-7.75 from 2002 and Christina produced a 19-5.75 performance back in 2005. For those who follow the sport closely, it's not surprising to hear that this is the duo who occupies these coveted positions. They both enjoyed decorated track and field careers, during Ohio high school competition and beyond. 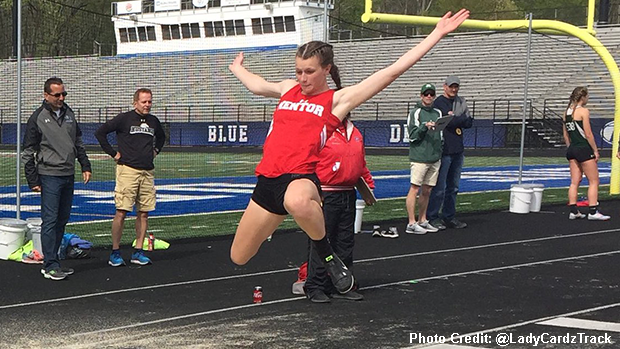 MileSplit tracked down Paige as well as her coach at Mentor, Bob Berwald for further insight on her background as an athlete, how her high school career has gone to this point and what the long-term vision is relating to her jumping progress.